There is nothing quite like freshly made pasta to make you feel like you are in Italy. The only catch is, freshly made pasta often comes at a hefty price. Fortunately, there's a way for you to eat all the fresh pasta you want at the comfort of your home at a low price. You can easily do so by getting yourself the best pasta maker available in the market today. If you don't have any idea on how to choose the right pasta maker for your kitchen, don't fret, because for this article, I will share with you a couple of tips on how to select the right pasta maker, as well as a list of great pasta makers that you should definitely check out. Which Pasta Maker Should You Get? When choosing any type of product, you should have a set of standards to consider before making a purchase to make sure that the product you get will fit your needs and personal preferences. Conventional pasta makers are ones that come with a hand crank. If you are planning on making small batches of pasta at home, a classic hand cranked pasta maker will do you just fine. But if you are planning on making large batches of pasta, I suggest you opt for an electrical pasta maker that can help you make fresh pasta in mere minutes. When looking for a pasta maker, you should keep an eye out for models that have adjustable rollers. A good pasta maker is one that has at least five thickness settings. Choosing a pasta maker with a lot of thickness settings means that you will be able to make more varieties of pasta. You should look for a pasta maker that is made up of stainless steel parts. Stainless steel is a good material when it comes to making pasta because it can be easily cleansed, and it doesn't add any metallic flavor to your pasta. You should also try out the parts beforehand to make sure that you will be able to handle the pasta maker with ease. To be specific, you should make sure that the crank can be turned smoothly. This electric pasta maker can help you make large batches of fresh pasta within minutes. It comes with 13 shaping discs that will let you make Udon, Vermicelli, Macaroni, Rotini, Ravioli, Angel Hair, Lasagna, Linguine, Spaghetti, Penne, and even sausages and dumplings. This pasta maker also lets you add in herbs to your dough for more flavorful pasta. This machine is easily a great choice for pasta maker newbies because it only requires a single push of a button to make fresh pasta. What's more is that its parts are easily removable for effortless cleaning. The Atlas is a well-known name in the pasta making industry, which is why you couldn't go wrong with getting yourself the Marcato Atlas Wellness 150 pasta maker. The Atlas pasta maker has parts made out of chrome plated steel and anodized aluminum that will let you create fresh pasta without any metal taste. This pasta maker is fairly easy and simple to use and comes with an easily adjustable dial that provides you with nine thickness settings for your pasta dough. 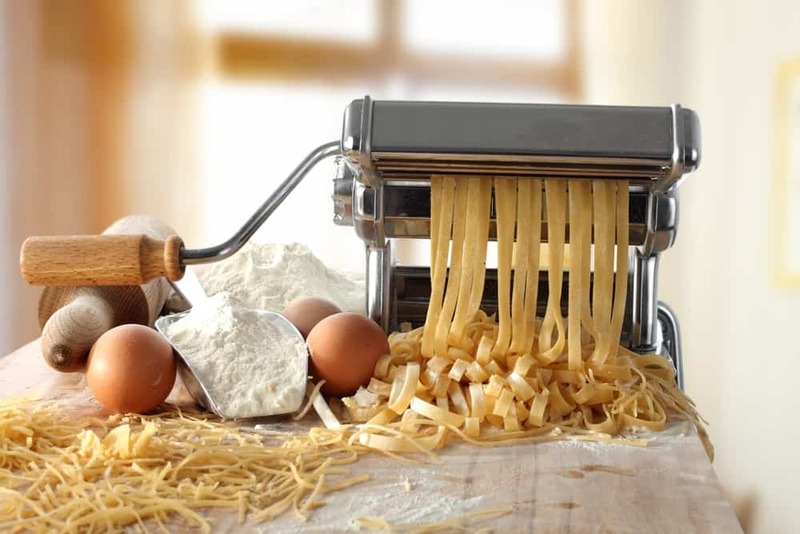 This pasta maker is great for making lasagna, fettuccini and taglioni. What's more is that its rollers come with a rough surface that will let you have porous pasta that absorbs sauce very well. This pasta ﻿﻿maker comes with a sleek and classic polished look that will surely suit your kitchen counter. What's great about this pasta maker is that it has nine thickness settings that will allow you to make all sorts of pasta like a pro. Another great feature of this pasta maker is that it comes with several cutter attachments that will let you make spaghetti or fettuccine with ease. You will also be able to easily clean this pasta maker since its rollers can easily be detached. Lastly, this pasta maker comes with a free-money-back guarantee that will save you a lot of stress if you ever need to send it back. The Philips ﻿﻿pasta ﻿﻿maker might be the quickest pasta maker in the market since it can help you make a pound of fresh pasta in just 15-minutes. This machine is great for beginners since it comes with automatic cooking functions that you can easily activate with a touch of a button. This pasta maker also offers four shaping discs that will let you make spaghetti, fettuccini, lasagna, and penne. This pasta maker also comes with an automatic shut-off function, a ready signal, and a safety lock that ensures efficiency and security. It also comes with non-slip feet that will prevent the machine from scratching the surface of your counter. If you choose to get this pasta maker, you will also get a cleaning tool, a measuring cup, and a recipe booklet. The Homdox fresh pasta maker is an affordable pasta maker that comes with 2 stainless steel cutting blades and 6 thickness settings that will let you make all sorts of pasta including lasagna, spaghetti, tagliatelle, ravioli, penne, fettuccini, linguini, vermicelli, and angel hair. This machine is great for beginners since it has a removable crank handle that can be turned smoothly with ease. It also comes with a clamp that you can use on your countertop for added stability. Of all the pasta makers I have mentioned in this article, you surely can't go wrong with the Gourmia GPM630 One Touch Automatic Pasta Maker. Though it might be a bit expensive, it is a great investment that will help you make all sorts of pasta really quick. It's also great for making large batches since it doesn't require the tiresome act of working with a hand crank.